I have a Casio FX-CG50 calculator. I'm doing matrix calculations and would like to input a matrix that has a variable in it, and when I evaluate the calculation to keep the variable. 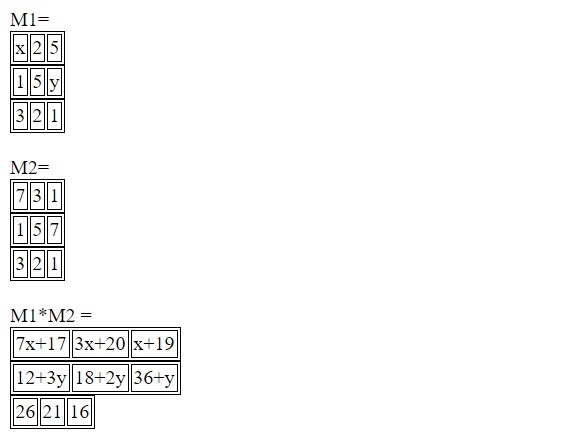 Those are the matrices I want to enter, and that is the result I need to get. The problem is that I don't know haw to enter variables when defining a matrix and also if it's possible to do that and get a result in that form. I want to ask, is this possible? And if yes, how to do it. If not, are there any addons or programs I can put on my calculator in order to achieve this? Edited by andics1, 12 October 2017 - 05:51 PM. Sadly that's not possible, though you could make a program that evaluates the matrices for you. You need a Classpad, or other calculator with CAS capabilities and matrix support under the CAS. In the computer you can use SageMath, Xcas, Mathematica or other programs.